The LF2 basketball nightmare comes to an end next week for either Limoges or Dunkerque Malo as they face each other. Neither team has won a match this season. Dunkerque Malo had a short trip to their coastal neighbours COB Calais in what was supposed to be a tough derby match. The suspense lasted about seven minutes with Dunkerque leading (14-11). Calais stepped on the accelerator and within a period of five minutes between the first and second quarter they scored 16 consecutive points (27-14). With just 13 minutes played the contest was over and so was the derby tension. 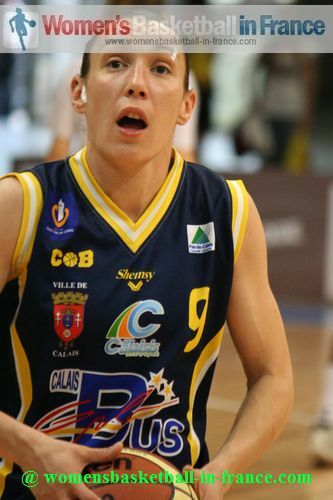 Calais went on to win (93-60) with 21 points coming from their captain Aurélie Cibert (in picture). Jenny Fouasseau and Kierra Millard with 17 and 16 points were not far behind while Mélanie Devaux chipped in 10 points. For Dunkerque Malo Dace Pierre Joseph, Mélissa Micaletto and Sabrina Scott had 21, 16 and 10 points respectively. The best game of the LF2 weekend was between Limoges ABC and Reims. Limoges, wearing a new kit, played their best basketball of the season and were on level terms with Reim BF (61-61) with five minutes to play. Anaïs Jomby (14 points) hit two big three-pointers in the closing minutes for Reims to finish with another victory (74-65) Maud Lesoudard missed out on a second perfect shooting week by a single shoot (6-of-7) to lead her team's scoring with 16 points. Léon Trégor had no problems in beating Pau Lacq Orthez (78-53). It appears that the players from Léon Trégor have been told to stop shooting three-pointers as only 8 shots were attempted during this game. Their captain Aude Kernévez was 2-of-4 from behind the arc and finished the game with 17 points. Pau Lacq Orthez have been bad away from home this season. By committing 24 turnovers and having no inside play they had no chance of upsetting their hosts. Roche Vendée needed 15 minutes to get going and then they cruised to victory against the CFBB (70-49). In the final match of the weekend Illkirch-Graffenstaden fell at home to US Laveyron (66-70). The SIG battled bravely and led (55-51). But with Bettina Kadila out of the game, it was not possible for Céline Schmitt-Sendner (19 points) to hold off Shenita Landry (27 points) and Elena Vishnyakova (12 points and 17 rebounds).